Delaware is no stranger to award-winning steaks and dinner entrees. These 10 best steakhouses feature some of the best that Delaware has to offer. Whether you are looking for farm to table fresh, Japanese steak, a meal inside the casino and gambling afterwards, we can help you plan your next night out! The king of the steak houses is none other than Delaware’s own Harry’s Savoy Grill in Wilmington. Xavier Teixido has worked his way up from a career at the Brandywine Race Track to Commander’s Palace in New Orleans, then back again to Wilmington where he began Harry’s Savoy Grill back in 1993. 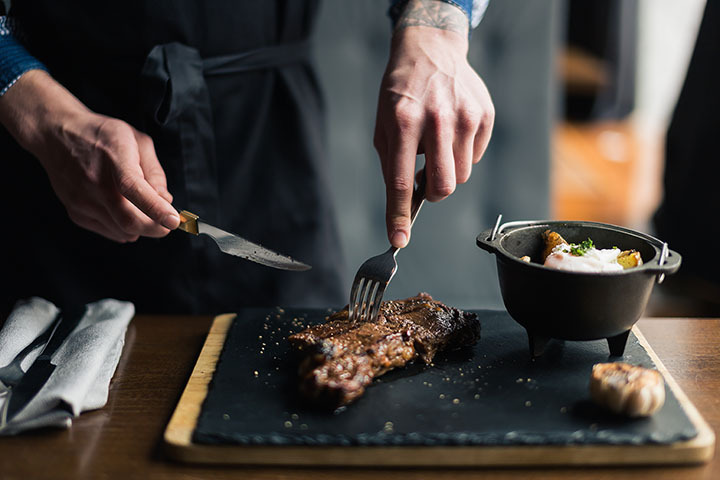 Years later, he is one of the leading steakhouses in the country with an award-winning restaurant with more menu options than area competitors. If you are looking for an exceptional steak dinner that will always be top-notch, head to Harry’s Savoy. Walter’s Steakhouse of Wilmington is the oldest known steak house in the city. Offering both private dining and a fixed price banquet, Walter’s offers multiple options for fine dining. Walter’s is exceptional for family get-togethers, rehearsal dinners, or business functions. Join them for the “Wine & Win,” Wednesday where if you guess the wine by drinking one glass, you win a Walter’s cheese board appetizer. Anyone who has been to the Rehoboth Beach outlets wouldn’t miss seeing the signs for the 1776 Steakhouse. Once you have finished shopping for the holidays, this is the best place to rest those shopper-weary legs and indulge your culinary delights. The 1776 Steakhouse invites you into their warm and relaxing atmosphere, and fills your belly with signature dishes such as the 1776 Crab & Lobster Bisque, Steak 1776 (filet mignon on mashers finished with lump crab sautéed in a cream reduction), and so much more! The Redfire Grill Steakhouse prides itself on providing superior and knowledgeable staff. Their menu features signature steaks, organic Lancaster chicken, Redfire Crab Cakes, and much more. Not in the mood for dinner? Check out their lunch menu and head over with your coworkers. Fans suggest trying the garlic bread and cite that the cheesy sauce served with it is to die for. Offering both a tasty menu and an entertaining dining experience, the Blue Moon in Rehoboth is a unique and lavish restaurant. Served in a restored Victorian home, the Blue Moon offers a fine dinner menu seven days a week beginning at 5 p.m. Join them on Sundays for an award-winning brunch and make sure to check their schedule of events for shows like Psychic Sundays with Cashetta, Tuesday Bingo with the Blue Moon Divas, Pamala Stanley, and the Friday Night spotlight show! New kid on the block Our Harvest is the second restaurant owned and operated by Ocean City’s Liquid Assets owner, John Trader. Boasting three fireplaces, and a barn room that is adorned in reclaimed wood from Worcester County, Trader set out to create an intimate atmosphere where folks could eat, drink, and dine together, laughing across the table and creating unforgettable dining experiences. Farm to table fresh, Our Harvest delivers high quality food from local fisherman, farmers, crabbers, and more. Where can you find an exceptional steak dinner that both delivers in the restaurant yet also preps meals for you to take and cook at home? At the Blue Water Grill, out of Millsboro. Now offering a meal prep program, the Blue Water Grill is constantly seeking to improve their quality of meats and service options for their customers. Try their signature honey cilantro dipping sauce (and buy some to take home!). Located inside the Dover Downs Hotel & Casino, Michele’s is one of the best steakhouses in Kent County. Check out their award-winning Sunday brunch and treat yourself to their omelet station or the crepes station. Where can you find an exceptional steak dinner, on the water, and enjoy it next to your dog on the dock? JP’s on the Wharf in Frederica, that’s where! Located in Bowers Beach on the Delaware Bay, JP’s on the Wharf pays homage to local fishermen and crabbers. Treat yourself to some of the best that the Delaware Bay area has to offer of crabs, steak and fish. You won’t be disappointed. One of the best flavors in life is sinking your teeth into a perfectly seared Japanese steak. At Mt. Fuji Steakhouse in Milford, you can enjoy a Hibachi steak, shrimp, salmon, chicken, and so much more. Enjoy fresh sushi from the sushi bar, tempura & katsu, maki or hand rolls, or this author’s personal favorite, shrimp tempura rolls. Be prepared to eat hard because their servings are huge.